Sticky Labels Blog | Company News | Christmas Stickers That We Think You’ll Love! Christmas is fast approaching and for many, that means time with the family, time away from work, lots of excess eating and maybe a drink or two! But it can also mean a logistical nightmare when it comes to buying presents and giving cards. Much as we love Christmas – and we do! 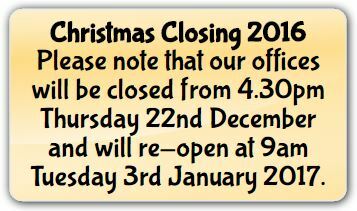 – when it comes to writing out all those cards, labelling all those presents and letting everyone know which days we’ll be open, it can start getting a little stressful. So let the Sticky Labels team’s Christmas stickers help you with the things that you may enjoy less that leftover Brussel sprouts! We stock a special range sticky labels that are exclusively for Christmas. 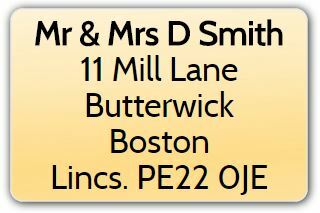 Whether you want a card or present labels, labels to let your customers know when you’ll be away or simple address labels, we have them all! You can view the Christmas labels page here but we’ll go into a little more detail about the range that we offer in this blog so you need to look no further for all of your Christmas sticker needs! It’s great to give and receive but one job that we always end up not enjoying is filling in the details on all of those cards! Writing every card individually soon gets tiresome and these days we’re all a bit more used to tapping a keyboard than holding a pen. It’s a good job we have Christmas card labels to save you the time and hassle! If you have to send more than about ten cards or you have a business that sends cards out in bulk then it may be best to get some pre-printed stickers that carry your custom message and names or business details. 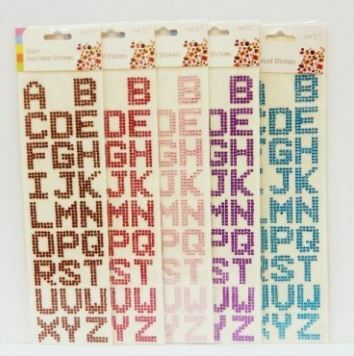 You can fully edit these to say whatever you’d like and at less than 10 pence per label, you’ll be able to get all of your cards completed without too much hassle… Or the threat of repetitive strain injury from all that pen-work! We do of course love giving and receiving a lovely present or two but keeping track of what is for who without labelling becomes pretty much impossible. We adopt a ‘label as we wrap’ technique so we don’t give auntie Mavis the present that was intended for young Billie. She doesn’t like Lego anyway. With our personalised Christmas present stickers, we can easily add the name of the person the present is for with all other pre-printed details remaining in place. 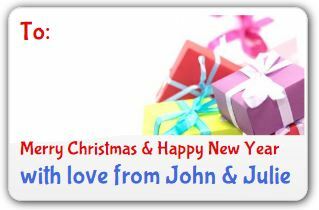 You even get to pick your custom greeting message so if you’re a business you may want to hold back on the “love from” when you give out the gift! Whether you want to look professional or simply save precious time on writing every present label out, these are the perfect, affordable solution. Because they are on a roll of 1000, they should see you through the next few years too… Unless you are giving gifts to everyone you know! Whilst most businesses will have a few days/weeks off over the festive period, it’s always best to let clients and customers know which days you’ll be at home eating the leftovers from Christmas dinner and when you’ll be manning the phones. 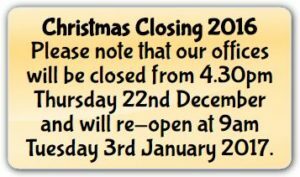 We’ve got shutdown-time labels that can be applied to any outgoing mail, cards or parcels on the run-up to the Christmas holidays so you won’t get bothered too much when you should be celebrating. You can customise these easily with your working hours and a message so you should hopefully be able to have that extra sherry and not worry about calls and visits to the workplace! 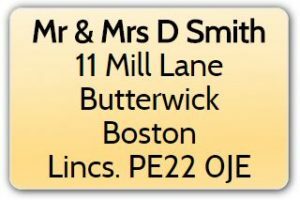 Whilst these are always incredibly useful whatever the time of the year, our personalised address labels are brilliant for doing exactly what their name would suggest; listing your name and address! These are especially useful for all those Christmas parcels or mail so you can pop your return address on the back. They’ll also be perfect for any business that may have a few extra deliveries and simply wants to place an adhesive sticker on the back of every item they are dispatching so their address is included. As always, they can be easily customised and changed to contain the details you want and we offer extremely competitive rates on all our stickers… With the fast 3 day print and dispatch time. The best thing you could do is to try our simple Label Builder for yourself so you can see how simple it is to make any sort of custom sticker you’d like, in any shape or colour you desire. These would make a brilliant present idea with a personal touch if you are looking for something a bit different! You can also check out our range of sticky things where we have some brilliant stickers for stocking fillers that might provide the last tick on the present list for your kids or friends. 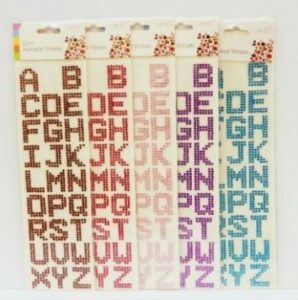 There are glittery alphabets and letters and even sticker residue removal items to help get adhesive off if the kids go wild and plaster everything with labels. You should ‘stick with us’ this Christmas!